One of the many signs of the fall season in Southern California is the browning of avocado leaves that is also called “tip burn” because the browning starts at the leaf tips. The photo above shows leaves on one of my Hass avocado trees in late fall. Why do they look like this? And what can be done about it? Why do avocado leaves turn brown? There is one primary culprit of the typical leaf burn that develops in the fall, and that’s chloride in our irrigation water. In Southern California, much of our water is imported from the Colorado River, a source which is salty. (What is a salt in this context? See Wikipedia’s salt page.) One of the salts that the Colorado River contains in unfortunately high proportions is chloride. How high is the chloride level? Usually from 80 to 100 parts per million. You can look at your particular water district’s annual quality report for more precise numbers, but most of Southern California is similar because we import from mostly the same sources. According to researchers at the University of California, in a study titled “Adoption of Water-Related Technology and Management Practices by the California Avocado Industry”, avocados suffer if the chloride level is over 75 parts per million. What happens is that all spring and summer we water our yards with this high-chloride water and most of our plants don’t show much dislike, but avocados are especially sensitive to it. Avocado roots take up the high-chloride water and move it up their tree’s trunk, out the branches, and into the leaves. Leaves breathe out this water, but while the water evaporates off the leaf surface, the chloride remains within. It’s like when you take a swim in the ocean and the sun dries the water off your skin but leaves a crust of salt. 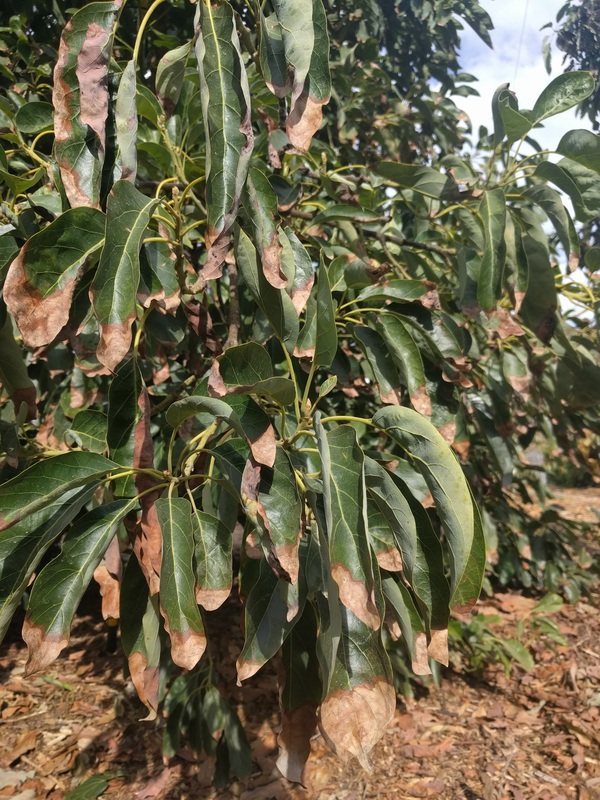 Over the irrigation season, the chloride level builds up in the avocado leaf until it reaches a toxic level and the leaf tissue begins dying, starting at the tip. That’s the brown: chloride-induced death. 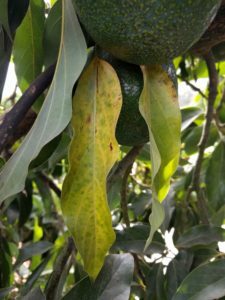 The phenomenon of chloride leaf burn has been understood by avocado farmers for a long time, at least 75 years. (Here’s an article from 1951 titled “Leaf Burn of Avocado”.) But I like to test things for myself if I can, so one year I watered two of my avocado trees entirely with rainwater that I’d stored in tanks. Rainwater contains almost no chloride. Sure enough, those two trees had perfect foliage while my others showed typical leaf burn that fall. Moreover, these two trees had shown tip burn in previous fall seasons. Not a conclusive trial by any means (one reason is that different avocado varieties have different salt tolerance) but it helped me believe what I’d always read. Lamb Hass given rainwater through summer 2015. Zero leaf burn that fall (when this photo was taken). Let me first note that minor tip burn on avocados is no big deal. More specifically, if less than about ten percent of a tree’s canopy is brown (dead), there should be no reduction in fruit yield. In other words, if a tree has only a little tip burn, it will still produce as much fruit as if it had perfect foliage. I’ve seen this play out over and over on my trees. Why does more than about ten percent leaf burn cause a reduction in yield? It’s because when the season for flowering begins (usually in late winter), the tree will drop those damaged leaves and grow new ones rather than do much flowering. Few flowers equals few fruit. The question then is how to keep the fall tip burn to a minimum. The answer is, in a phrase: water a lot. The one good thing about chloride is that it moves with water. Because of this, commercial farmers primarily manage it through leaching, as can we home gardeners. By leaching, I mean that they overwater on purpose so that the extra water will carry the chloride that has built up in the soil down deeper into the soil, so deep that it is below the reach of the tree’s roots — and therefore no longer able to affect the tree. There are two main ways to leach. You can water a lot at one particular time. For example, farmers who use micro-sprinklers will run the sprinklers for up to 24 hours straight, and they’ll do this once a month in July, August, and September. Alternatively, you can water a little extra every time you irrigate. This is called adding a “leaching fraction”, and the fraction is usually 10 to 20 percent on top of what the tree needs to grow well otherwise. For myself, I’ve done it both ways and seen slightly better results with a leaching fraction as opposed to monthly leachings. So, these days, I deal with chloride by watering a little extra every time I water. 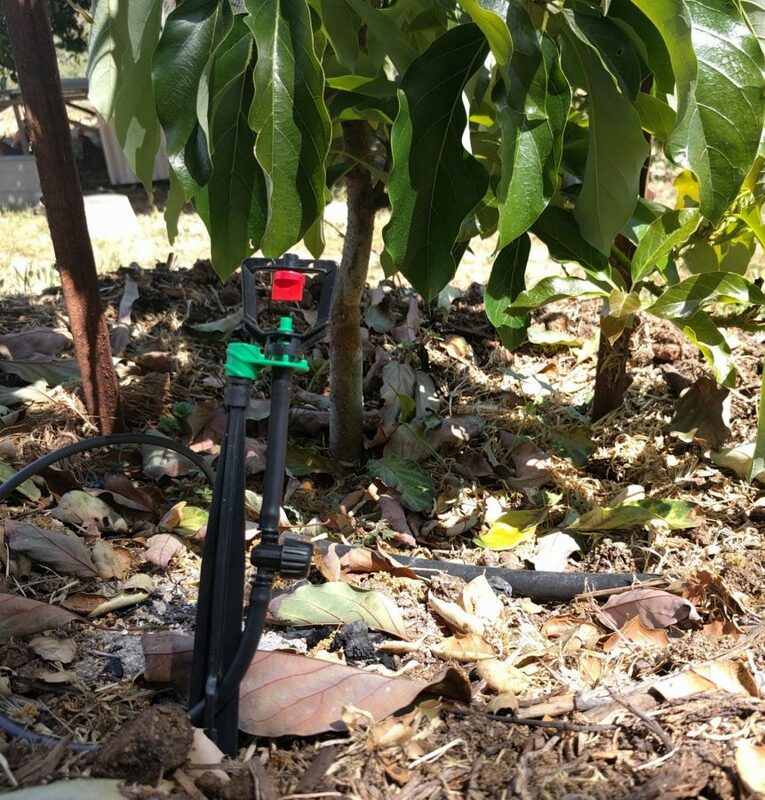 Any type of sprinkler will do, but the one I am using on most of my new trees is this versatile DIG Micro-Sprinkler. 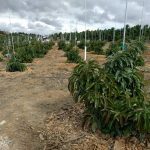 If you’d like some guidance on how much and how often to water avocado trees in order to keep leaf burn to a minimum (and fruit production to a maximum! 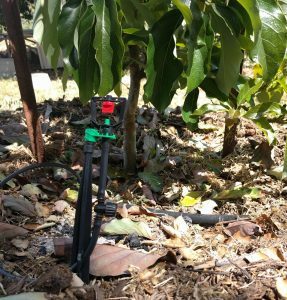 ), see my post, “How much and how often to water avocado trees in California.” There I provide a table with recommendations on gallons and frequencies according to the size of the tree. These are primarily based on what has worked for my avocado trees over the years. Look at the south side of your avocado tree. Notice the amount of leaf burn. Now compare it to the north side. Always, the leaves on the north side are a deeper green and have less browning. And this is related to the fact that the sun shines on the south side more intensely, extracting more water from those leaves every single day of the year, which means more chloride is collecting in those leaves compared to the north side. Also note that an avocado leaf that dies a natural death — a healthy death, you could say — a death from old age (called senescence by botanists), does not die starting at the tip nor does it turn brown before it falls. It turns uniformly yellow. Avocado leaves damaged by cold look different than tip burn caused by chloride. Cold temperatures can make young leaves curl up and brown while older leaves take on a mottled browning. If the air gets extremely cold, say low 20s, then avocado leaves completely brown and dry up within days and they don’t even drop from the tree. 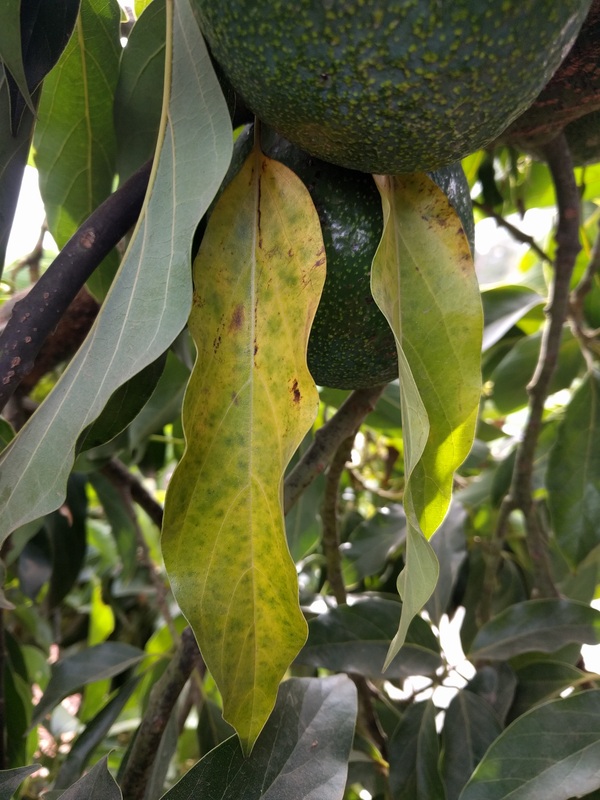 As I mentioned earlier, avocado varieties differ in their tolerance to chloride, and therefore get worse tip burn. Hass is particularly sensitive to chloride, unfortunately. Reed and Fuerte, on the other hand, are two which show more tolerance. I’ve observed this in my own Reed and Fuerte trees as well as those of others. May your avocado leaves be mostly green this fall, and may they be flowery and fruitful come spring. If not, more water ought to solve your lot. Just to show the yearly process with avocado trees and their response to chloride-damaged leaves, I’ve taken a couple photos of the same Hass tree as above, now in spring. These photos are also of the same branches on the north and south sides of the tree. This is the south side. Note that almost all of the leaves are new. The tree has grown them in the past month or two. And note that almost all of the old leaves that had tip burn have been shed. Some new leaves, but still many old leaves hanging on. This is because they weren’t as damaged as the ones on the south side, and so the tree still finds them useful. Therefore, the tree doesn’t feel the need to put its energy into shedding them and growing new leaves to replace them — and is able to allocate more energy into flowering and fruiting. 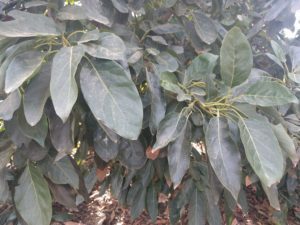 Do avocado trees need a lot of water? Funny you should mention that. I put a chlorine filter on my Christmas wishlist this year. I don’t know anyone who filters both their household water and irrigation water (not for chlorine, anyway). I’m going to ask around though. 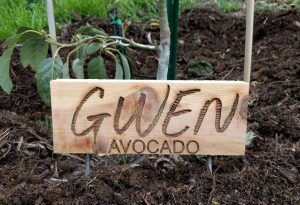 It’s something I’ve been considering for avocados especially and plan to try it on some of my trees this coming summer. For me, the deterrent has always been the cost since you can just add more water to leach for cheaper. Also, since I already have rain tanks, I have that source of extra clean water to help. But I remain curious about using filters and am going to finally try it despite the cost. I’m planning to just use a simple carbon filter that has hose thread, and I’ll install it on one irrigation station. If you end up trying a filter too, please let me know how it goes. Shark tank idea. Make a device that filters as you spray it through hose. I’ve bought and installed a device that may do the trick: a CAMCO RV Filter. I’ll add some words and photos about it to the end of the post above. It will be at least six months until I get any idea of whether it’s effective, but the experiment has begun . . .
How cool…definitely interested in seeing the results, good luck Greg!! I looked it up on Amazon. It appears to filter chlorine but not chloride. My goodness, what’s wrong with me? How did I overlook that one? You’re absolutely right. Thanks for calling it to my attention. I’ve got the filter installed so I might as well let it go through the summer to see if there are any noticeable effects, but it won’t be due to the removal of chloride! I’m going to remove the mention of the filter in the post above so it doesn’t mislead anyone who doesn’t read these comments. Writing here in April 2019, I see no evidence that the CAMCO RV carbon filter has benefited my avocado trees at all. Compared to my other avocado trees not on the irrigation line of the filter, these trees have as much tip burn. Also, compared to the appearance of the trees in previous years, the tip burn is about the same (actually a bit worse this year). I’ve now removed the filter and see no reason to try it further. A friend of mine has a good size Haas tree in Carlsbad that he waters using the water spigot on the side of his house. It’s a gorgeous tree with not a single brown-tipped leaf – I didn’t even recognize it for an avocado tree at first. It bewildered me at first, but then it clicked and I asked him if he had a whole house water filtration system (he did). With whole house filtration, the irrigation water isn’t filtered, but the hose spigots that come out of the wall are filtered. I’ve since seen another similar tree in Encinitas and inquired with the home-owner and confirmed the same setup. Thanks for sharing that. Any chance you know the kind of filter your friend is using (reverse osmosis, etc.)? Have you seen the tree in December? That’s about when avocados show the most tip burn. I wonder how it looks at that time. Mid-summer is when avocados typically look their best. That seems like it should work. I’m unsure of what effect it would have on the chloride in the water. I don’t see that being affected, but chlorine is unhelpful to the plants so it shouldn’t be a bad thing to get rid of it. 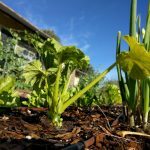 As usual, another great write-up with perfectly timed suggestions…especially as we head into fall and winter…hopefully both seasons will favor us with mucho rain. Thanks, Jock! Praying for rain . . .
Last summer I planted a 15 gallon Wurtz. It had pretty bad sunburn and it lost lots of leaves, exacerbating exposure issues. It hasn’t put on any new growth, and I was wondering if you thought I should pull it and start over. I am in Zone 23, and it’s planted in a very sunny wind free spot. I’ve learned to go to great lengths to take great care of young avocado trees, but also to not waste time in removing and replacing young avocado trees that aren’t thriving. It seems that if an avocado doesn’t get a rapid and smooth start to life, it never fully recovers. I’ve experienced this over and over, unfortunately. That is to say, unless your Wurtz makes an amazing show of new growth by the end of February, which is the latest any avocado tree in Zone 23 could possibly wait to start flushing, I’d shop for a replacement in March. Okay, thanks for the definitive timeline. I planted a Wurtz because it is on a slope and there isn’t a ton of space. 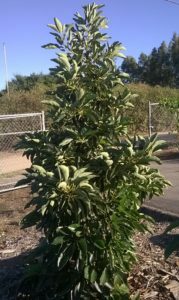 Once I remove it, should I plant another dwarf avocado, a Haas or something similar, or a different tree there altogether? I’d like to go for another avocado if possible. Is it possible to prune a Haas by topping it to be 10 feet tall, bushy, and productive (like I thought the Wurtz would be)? Yes, you can keep a Hass productive at 10 feet tall through consistent and skilled pruning. I have a Hass that I keep productive at just under 15 feet tall, and I know of other similar Hass trees. Also, the most common method of planting new commercial groves is to plant trees very close together and prune them, some to as short as seven feet tall. But you might also consider a Reed. Reeds are even more productive than Hass but with a less spreading canopy, so they are easier to keep within the bounds of 10 feet. For example, my Reed is the same age as my Hass, but is still only 12 feet tall without having been pruned. (I’ve already pruned my Hass a number of times to keep it down to 15 feet tall.) The trees are both entering their fifth years in the ground. Plus, Reed tastes great, everybody agrees. One other variety that is easy to keep pruned down and that also tastes great and is available to buy at many nurseries is Lamb. (Its official name is Lamb/Hass, but I hate to use that name because it’s misleading.) I like my Lamb tree a lot, but if I had to choose between it and Reed, I’d choose Reed. All three of these varieties (Hass, Reed, and Lamb) produce well as lone trees. Thanks a lot for the great info, much appreciated. I’m going to give it until the end of February and then replace it with one of the varieties you’ve mentioned. Thanks for such a fast response too, your site is great. Forgot to ask: Can an avocado tree recover from bad sunburn? Depends a bit on the nature of the sunburn. If it’s a single branch that’s badly burned, then recovery is very possible. That branch can be pruned out and any other exposed branches can then be painted for protection. But if many branches — especially on a young tree — have been burned, the likelihood of recovery is low. Part of the reason is that this kind of thing only happens if a young tree has been stressed from poor irrigation or gopher damage to roots in the first place. That will cause it to lose leaves and expose its branches. So it’s like a damaged tree just got further damaged by sunburn. I recently coddled such a tree for over a year before giving up on it. Update: There hasn’t been any really growth happening, some branches are starting to shrivel with entire leaves turning brown. So I lopped the top 2/3 off, and discovered inside the trunk was half rotten (on the side that was sunburned). Continued lopping to get to a healthy looking trunk, which eventually happened about a foot above the graft. Decided to yank the whole thing to be safe health wise, and sterilized my tools. I was curious if you happened to know any diseases that cause 1/2 of an entire trunk to go bad (or if it was just a fatal sunburn)? My guess would be sunburn as the cause if the dead side of the trunk were the south- or west-facing sides (where the hottest sun comes from). After the bark gets sunburned, it blackens and dies and shrivels and shrinks, actually sinks inward, if the sunburn is bad enough. I planted a cold hardy avocado this last spring, I live in Louisiana, zone 9b. The tree did great for awhile and it’s still alive but all the leaves are brown and dried up. We did get a couple of hard freezes and snow this year (surprisingly) but I made sure to wrap up the trees. I built something around the tree to keep out the cold and during sunny days I would take the top off so that the tree could get sun. We live with no bright sun for days and it rains a lot. Is it possible that it’s just not getting enough sun light? Every leaf is brown but the stems are still green. Help?!!! It sounds like you did everything right. Avocados actually don’t require as much bright sunlight as some other fruit trees, especially when they’re young, so I would guess that’s not the problem. The issue might just be the cold, and more specifically, prolonged cold. Sometimes, a brief dip below freezing does nothing, yet a night with many hours below freezing does damage. Many subfreezing nights in a row are even worse. Anyway, if the limbs are still alive then paint them white to protect from sunburn and enjoy watching new leaves grow in spring. I hope your tree comes back strong! In late winter in Southern California, avocados tend to look their worst. Some will have tip burn plus maybe browning from cold damage. Then when they start to flower, many of their old leaves will turn yellow and soon drop. If the tree is generally healthy, all will turn out fine. By June, the tree will have grown new leaves and be green and carrying small fruit. What I mean to say is that the appearance of an avocado tree can be unattractive here in late winter even though it is not diseased or dying. Have two trees, 40+ years old. Coastal S. Cal. Tips of leaves get brown shortly after they grow to full size, drooping as well. Lots of flowers, but fruit is small. Is this due to chloride in water? Thanks for info. In reading the UC guideline provided, not good. ..bummer. Why watering more would remove the chloride since chloride comes from the water??? Doesn’t it bring more chloride?? Thank you!!! If your water has a chloride concentration of 75 parts per million, then your soil might eventually have a chloride concentration of 100 parts per million in the upper three inches if you have been watering lightly and because the sun has been evaporating water there in the upper three inches but leaving the chloride behind. This raises the chloride level over time. So then you water a lot (overwater) with your 75 ppm water and essentially wash the chloride down through the soil profile until it is below the level of the roots (since chloride moves with water). Now your soil in the upper three inches is back near 75 ppm: the level of your water. Thank you for the info! I live in Costa Mesa and my 7 year old avocado had a ton of flowers in the past few weeks and the bees have been having at them. Last year was the first year it fruited and I got about 8 good avocados. Unfortunately last year I started getting spots on my leaves and I think I got mites. I am worried that if it gets worse it will really harm the tree. Any recommendations or anyone I can send pics to? Now I have a decent amount of other leaves near the top yellowing and browning in a different way and I am worried I have a disease of some sort. 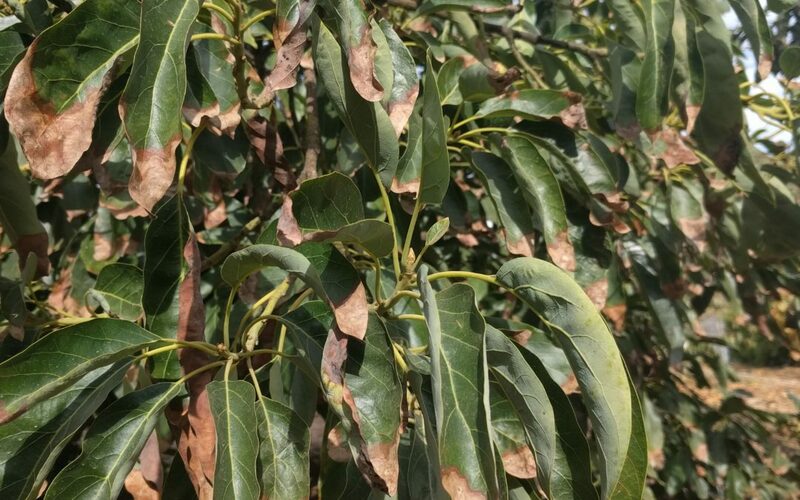 During flowering, avocado trees often also shed older leaves so this might be what’s happening. 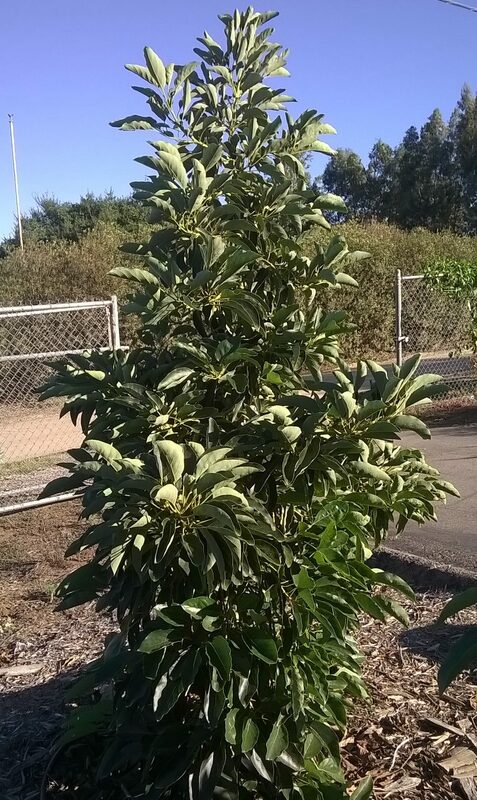 Thanks for the amazing blog post on Avocado trees. I live in Santa Clara county. Mine is planted on the ground and is about 7-8 years old. It has just started giving fruit (got about 3-4) so far. We noticed the leaves turned brown and like your post, one browning looks like due to excess chlorine and the other one seems a bit different (not sure if its due to cold or its normal). The branches of the tree are also getting brown. I read your post about tree painting and am considering trying that out in addition to watering more. There is also a branch that is kind of weak and leaning onto a support. The remaining branches look fine though. I wanted to share two pictures with you (one with different brown leaves and one of the branch) but I don’t think the email was sent successfully due to the message limit. Your opinion and help will be greatly appreciated. Thanks a lot for your blog again. Your comment reminds me that one of the most beautiful Fuerte trees I’ve ever seen was up your way in San Jose. Anyway, send a photo of your branch and leaves, and hopefully we can identify what’s going on. Thank you very much for the information. I live in California and my eight foot newly planted avocado tree looks like it is in a precarious state with the leaves turning brown and crispy. I used mulch as suggested . Now I will have to water a lot more. I would never have guessed The water from the Colorado River is salty. I thought ocean water was salty and river water was fresh. What about citrus leaves curling up and turning brown and there is a swirling silvery residue left behind on the leaves? I keep cutting the leaves I consider “diseased” to the point of my trees almost getting bald. Does it sound like a disease of some type? I am afraid to use pesticides. I eat only organic hence my planting food sources. Thanks again. If a newly planted tree has brown, crispy leaves it’s likely because of not watering often enough, especially during a heat wave. Maybe that’s your case? I have a miniature avo growing in a pot–I recently moved it from the garden-bag it was in when bought. It’s just approaching winter here, and we’ve had a mild, not-too-hot summer. During summer, my avo lost all its leaves, and over the past few weeks has sprouted new shoots all along branches (including tips of course). However, the tips of every branch are browning and drying off, with any new shoots overrun drying up also. It was in response to the new shoots that I decided to move it into larger pot, fresh soil, but the burning tips have become more pronounced. I suspect some salt build-up from early-summer fertilizer, but reading above I’m beginning to also suspect root-rot. I would treat for root-rot but the product I use relies on absorption through the leaves . . . and there are none! So, do you think my lovely little tree is doomed, or would flushing of salts possibly bring salvation? Man, avocado trees in containers are extra sensitive! Often it seems that the leaf burn of potted trees is due to not watering often enough especially during hot spells, plus salt damage. I’m inclined to say never fertilize a potted avocado unless you’re absolutely sure it needs it. Maybe your tree can recover if you hold off on fertilizer and water only when the surface of the soil has dried through the winter, so as not to exacerbate root rot, if that’s the issue. Then next summer be sure to never let it dry out. Also, go ahead and give it one thorough flushing now. Hi Greg: I love the information you have provided. I grew up in San Diego County and my parents had an amazing avocado that produced fruit throughout my childhood. I live in Missoula Montana now. I decided to plant the seed of an avocado in a pot, because I recall the beauty of the leaves. I am not expecting to grow fruit with this young tree in a pot. My questions are: Can I repot into larger container now, or only in early spring? When I re-pot, go up one size or 2 sizes? 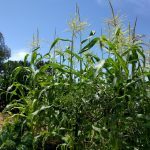 Do I fertilize with low nitrogen fertilizer? My tree has nice green lush leaves but they droop. Is that Ok? Leaf tip browing from underwatering or from sunburn? I only use spring water on my plants. Missoula is a beautiful place. A couple of our good friends live there. You can repot an avocado tree any time, and I would go up just one size. I have never actually found the need to fertilize an avocado seedling in a pot, but I’ve also never kept one potted for more than a year or so (since they can go into the ground here). One time a long time ago when I fertilized a potted avocado it got bad leaf burn, so I’ve always held off since. Avocado leaves naturally droop somewhat so yours are probably fine as long as they’re uniformly green like you say. (Young leaves are red.) When avocados are too hot or thirsty, they droop excessively and they also lose their shine. I live in Sonoma County and planted my grafted Little Cado in a container 3 years ago. I transplanted it into a larger, wine barrel-sized container this year. It is stunning, with the leaves a beautiful green and auburn new growth, just like in your “Spring Update” picture above. Unfortunately, I haven’t seen any evidence of fruit yet. Is there a chance it will still produce fruit? The gardener who planted it didn’t do much fertilizing (if any), and the one who took over after one year has fertilized every 2-3 months for the last 2 years. Should I fertilize more often (e.g. monthly) or do anything else to support fruit growth? If your tree’s foliage looks good, then don’t bother fertilizing. Here in mid June, it’s likely that the period of flowering for your tree is over for this year, so no further chance of fruit this year. Look for the tree to flower next starting in the winter probably. When flowering starts, your concern will be pollination. 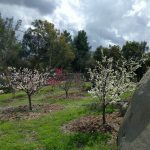 A small, lone tree is not in a good position to set much fruit, but a lot of bees in the vicinity will help the most. It is bees that do most avocado pollination. I live in Melbourne, Australia and recently decided to try my hand at growing some Avocados from seed. I’ve had great success with sprouting 10 out of 12 seeds. I recently transferred the sprouted seeds to pots as per the instructions in one of your previous posts. The leaves on one plant in particular have started to turn brown and shrivel up. They’ve only been in the pots for a few weeks and I’m using exactly the same tap water I used to sprout them. I’m also getting new growth on this plant. After reading the above and your previous post I’m assuming this is possibly a build up of salt in the soil?? If you have a moment to let me know your thoughts I’d greatly appreciate it. It might just be that your little avocado in the pot got thirsty for a spell, which turned its leaves brown, but now it has enough water and so is growing well again. Avocados in pots are extremely sensitive like this since their soil volume is extremely limited; the soil also usually heats up more than ground soil because the pot’s sides can be heated by the sun. It’s ideal to use very clean water (i.e. unsalty water) for avocados in pots, but it’s not necessary. Your tap water might work acceptably. I use tap water, and I have decent results with seedling avocados in pots when I water thoroughly every time I water. I always water until water is running out of the holes in the bottom. That being said, my avocados in pots never look as good as those grown by my friend who uses water that has gone through a series of filters, including reverse osmosis. At my Ranch a Cow chewed off my first Hass avocado. She Smelled something. We just bought our Mexicola avocado tree about a week ago, it’s still pretty small so we just have it in a 24” tree box right now. On Friday we got hit with 115 degree heat and our poor tree wilted within hours. We’ve been trying to keep it watered but it’s showing no signs of recovery. The leaves are dry and the leaves that are still soft have brown patches on them. Is this a combination of shock from the heat and the chloride in the water? I’m hoping that our tree is t completely without hope after only having it a week! It’s not your fault. It’s the temperature. Avocados simply can’t take 115 degrees. Moreover, trees in containers are more vulnerable to heat stress than trees in the ground since they have such a limited soil volume from which to drink, in addition to the fact that the soil in the container heats up more than the ground. Your tree might recover. About now you should be able to see the extent of the damage. This Friday, my post will be about this last heat wave and how to care for damaged plants such as your avocado. I’m in the same boat with some of my trees! I accidentally put too much avocado tree fertilizer on a 4-5 feet avocado tree. In addition temperatures have been 115 ! Leaves curled up and are toasted :(. Small branches look a bit brown :(. Sorry about your tree. Ouch. I’ve found it very hard and slow to get newly planted trees back to good health if they’re severely damaged like yours. These days, I usually just buy a new tree to replace it. There’s the possibility of hope for yours though. It all depends on how many green leaves it has left and how carefully you can care for it for the rest of this summer and fall. And see this Friday’s post too, which will be about the recent heat wave, its damage, and dealing with it. Talk to you then. I live near Cape Town in South Africa. I have a Pinkerton and a Fuerte both grafted to one root-stock. 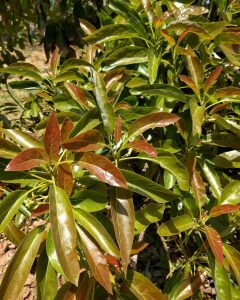 The Pinkerton leaves are healthy with no bad signs but the Fuerte has tip burn, yellowing under size leaves. I have always watered the tree with rainwater. Both being on the same root-stock is puzzling. That’s extremely puzzling. In Southern California conditions, it is always the Pinkerton that has poorer foliage than Fuerte when things get stressful. Also, it so happens that I too have a tree on a single rootstock with both Fuerte and Pinkerton grafted on. For that tree, both varieties have approximately equivalent foliage appearance. Here our seedling rootstocks are mostly of the Mexican type, especially Zutano. Do you know what your rootstock is? Might there be a mild fungal disease affecting only the Fuerte limbs? Do you see any lesions, cankers, white powder, or streaks? Hello Greg, I have a question? The top of my avocado tree trunk is black (look like is burned) but the rest of the tree looks good and healthy, only a few leaves are brown. Do you know what I should do to make sure my tree keep growing? Do I should cut the top or what I should do? Thanks, its about 5’6″ feet tall right now. You don’t need to do anything special or different to make sure your tree keeps growing. If you’re in Southern California, then you can expect the tree to have at least one more burst of new leaves before the end of the year. Thank you, yes I live in Southern California, I Will do that. I saw the video and the only different is that the part that is burned on my tree is the top of the trunk so there are not other branches that can shade it, I dont think is going to grow, because looks really dry its only like 4 inches are burned, I was trying to sent you a picture but I believe is not possible through here. Please let me know if you know what to do in my case. Thank you. Thanks again for all the great advice you give. You are quite the resource! So, I’m very concerned about my tree. It is very tall–about 30 ft and probably 35 years old, I’m guessing. It has less than a full canopy now and there are some new green leaves in various areas but some very dead areas as well. Now there is a crack on a large branch about 5 feet from the base. My gardner tapped on it and it sounds a bit hollow compared to other branches and the trunk although there is green growth all over the place off that branch. I don’t want to lose it! And I’m really worried about the tree in general. Can I send you some pictures? Let me know. Thanks so much! Thanks! And sorry to hear about your tree. Yes, send a couple photos from close up and farther away. Just sent the photos, Greg. Thanks again! Im a little confused. My Cold Hardy is in a pot and i’ve been trying to figure out why these leaves are the way they are – THANK YOU SO MUCH for answer this question. But how could overwatering my tree help remove the Chlorine? Is it because after it evaporates, concentrated chlorine stays behind and you want to drench it to wash away the concentrated chlorine? Do you recommend watering MORE often? I was always told to not water unless its already very dry. Thanks so much! Your avocado tree in a pot might have damaged leaves for reasons not related to chloride in the water. It sounds to me like you might not have watered often enough. You definitely don’t want to wait to water until the potting mix/soil is very dry. Avocados don’t like that. As long as your pot has holes in the bottom, and the mix/soil is not dense (like actual dirt is), then it’s hard to overwater an avocado tree in a pot as long as it’s getting plenty of sun. For example, avocado trees in pots at nurseries here in Southern California often need to be watered every single day during the summer. Hi Greg! Would love to send you a picture of a large old tree in our yard. The leaf burn is pretty significant this year compared to past and I really want to try and make it better! Is there and email I can shoot you picture at? I’m sorry to hear about your trees. Last year was very hard on avocados because of the dry winter and hot summer, but this wet winter should help. You might want to wait and see how the trees do this spring as they benefit from those winter rains and try to replace their lost canopy. A couple of my trees look bad too. If around July, your trees still look bad then take action. Greg, thanks for all the useful info you have on your website. 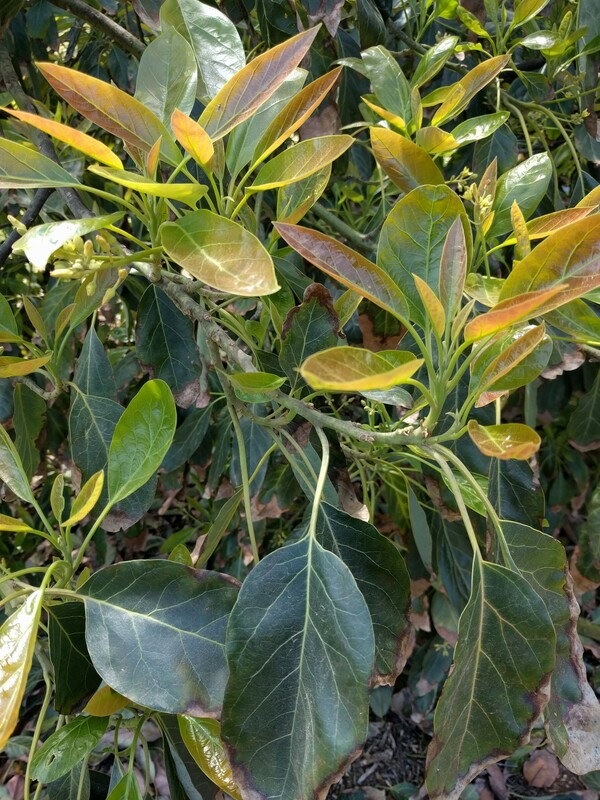 I have a large Fuerte tree in my yard that shows the symptoms of chloride leaf burn every year and drops its leaves each spring (I live in Pasadena). I ran across some info recently on plants that accumulate salts and was thinking of underplanting the tree with such a plant to see if it helps. Have you heard of this being done with avocados? I haven’t heard of anyone trying this with avocados. I’m going to ask a couple of soil scientists who work with avocados and I’ll post again on this comment thread if I learn anything. The plants used to accumulate chloride must be removed at some point or they will just be delivering the accumulated chloride back to the soil below. Anything planted with the avocados will be competing with them for water. So you’re going to have to water more if done outside of winter. Because of this, ideally, you’d grow a winter annual that can use our free California rainfall (when we have it).